Whether you take a lot of pictures using your Android phone or not, you might want to automate the process of backing up your photos so that you don't lose them in case of any disaster. There are a number of ways to back up your photos, like manually copying them to your PC or uploading them to a local file server, and there are also a number of cloud service apps for Android which automatically copy your photos to the cloud and sync them across your different devices, but this article is aimed at the three best cloud backup solutions that also work with Ubuntu. Note: Ubuntu One has also got a Windows client and supports iPhone and iPad as well, so this is not limited to Ubuntu and Android only. 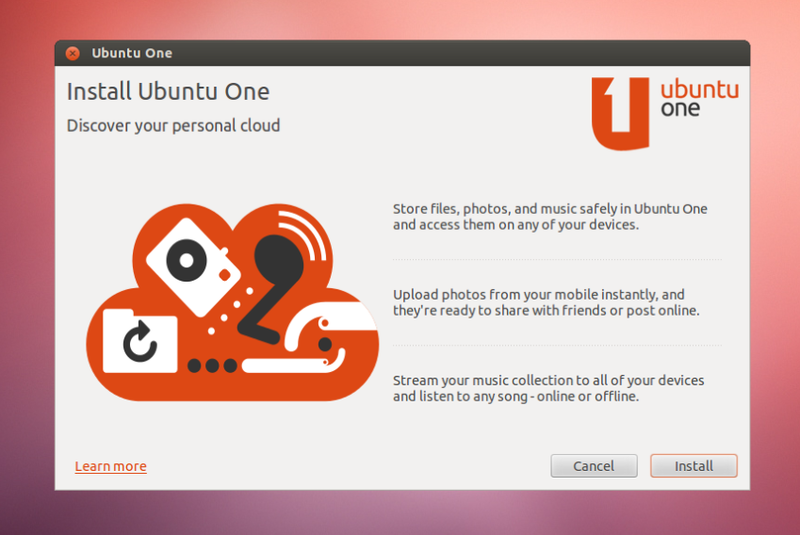 Ubuntu One is Canonical's cloud storage service, and it is nicely integrated into Ubuntu. In fact, Ubuntu, by default, comes with an Ubuntu One client which only requires you to feed in your credentials without needing to go through any geeky setups. The default folder used for synchronization named 'Ubuntu One' is located in your home directory. Costs: Free up to 5 GB. Pros: Your uploads will be automatically synced between all your devices and you'll always have a locally stored copy of your photos in full resolution. Cons: Limited free space - however, you can go for a paid upgrade. 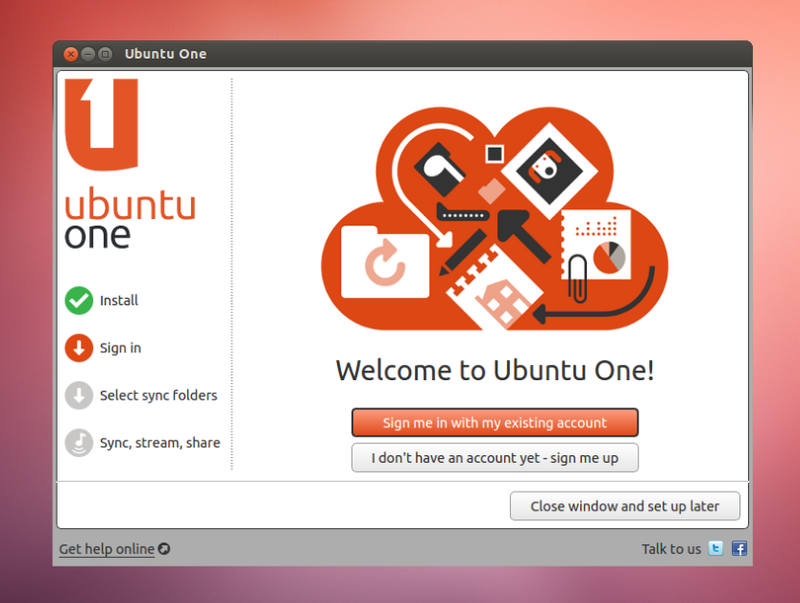 Simply open the Ubuntu One client by searching the Dash, or via the classic Gnome menu, and in the window that opens up, click 'Install'. Once installed, sign in, or if you don't already have an account, choose the 'sign me up' option and create a new account. 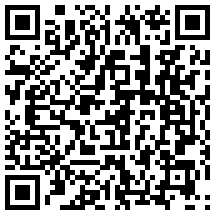 Or by simply scanning this QR Code. 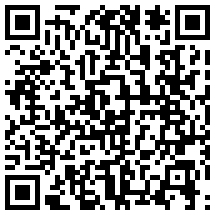 Once installed, open it up and sign in using your credentials. 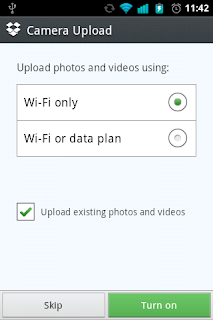 It might automatically present you with options to set up automatic uploads for your photos (I can't remember how it works for a newly created account). If it does, you can set up the frequency of your uploads and the upload directory right here. If it doesn't present you with such options, just press the 'Menu' soft-key and go to 'Settings > Configure auto-upload'. 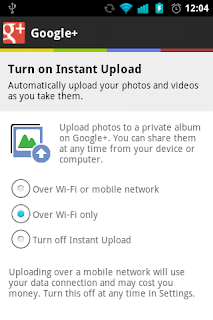 Enable 'Auto-upload photos' here and choose your 'Upload directory'. 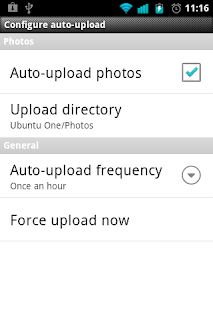 For the 'Auto-upload frequency', you can choose anything between 'Instantly' and 'Once a day'. 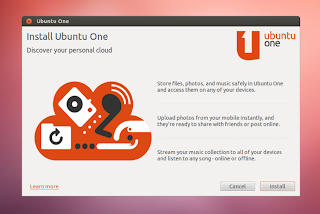 Now, your photos from your Android phone will be automatically uploaded to the cloud and then synced to all of your Ubuntu One devices. Note: Dropbox has got Windows and Mac clients and supports iPhone, iPad and Blackberry also, so this is not limited to Ubuntu and Android only. Dropbox is a proprietary cloud storage service, but it has got nice support for Linux and Ubuntu. 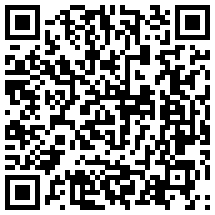 Cost: Free up to 2 GB (at the time of sign up, however, you can earn up to 16 GB with referrals). For accessing 'Camera Upload' settings at a later time, press the 'Menu' soft-key on your phone and go to 'Settings'. Note: Google+ can be accessed from a web browser independently from the used OS and it has got an iPhone app also, so this is not limited to Ubuntu and Android only. Google+ is by far my favorite photo storage service. Photos uploaded from the phone go to a private album called 'Photos from phone' and are obviously not available for public viewing unless you decide to share. It also backs up recorded videos automatically. Pros: Back up both photos and videos and share them to Circles, specific friends or to Public on Google+. Cons: No locally stored copies, everything is stored in the cloud. No Ubuntu setup is needed at all. All you need is a Google account and a web browser. For accessing 'Instant Upload' settings at a later time, press the 'Menu' soft-key on your phone and go to 'Settings'.